Members of a right wing Hindu group allegedly beat up two Muslim women who had been arrested by the police for carrying beef. The incident occurred at Mandsaur railway station in Madhya Pradesh on Tuesday. The possession and consumption of beef is banned in the state. The police had received a tip-off that the women, arriving from Jaora, were carrying beef to be sold in Maundar. They met the train and detained the women. 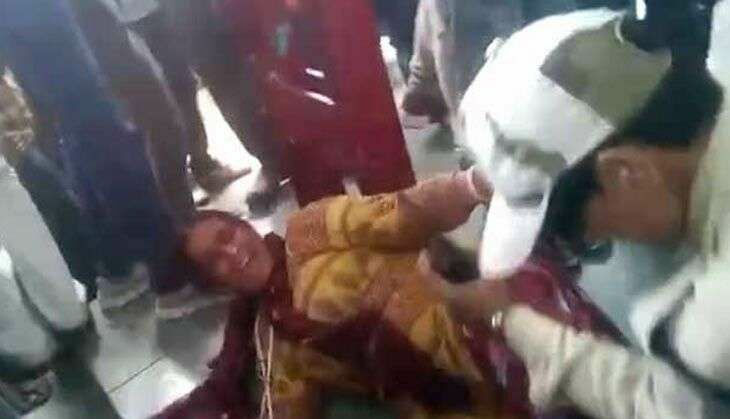 However, even though they were in police custody, the women were beaten up by a mob of people, according to a video posted on social media by an eye witness, says NDTV. The video shows a mob attacking the two women. Police officers were seen asking the crowd to keep their distance, but failed to control them. The thrashing continued for nearly half an hour before the women were taken to the police station, where about 30 kg of meat was recovered from them. The meat, upon examination by local doctors, was found to be from buffalos. The two women have been remanded to judicial custody for smuggling buffalo meat. However, no action has been taken against the mob that publicly assaulted the women in the presence of the police.